Email is a very useful tool for anyone who’s trying to run an online business. An email list has always been the biggest asset an internet marketer could build because it’s proven effective in creating revenue for a business… If done correctly. Patric Chan has created Mini Course Formula to show people how to create a miniature course to entice people to sign up to your email list and then purchase a product you’ll eventually promote. But is it any good? 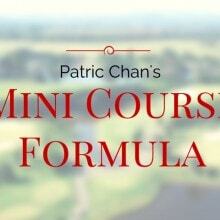 I’m not an affiliate for Mini Course Formula. We don’t like backing products we aren’t 100% happy with or that we know won’t be extremely helpful to our followers. Has Patric Chan created something that’ll make the small but prestigious “Positive Reviews” list? 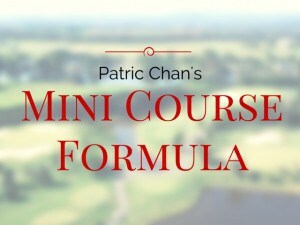 Mini Course Formula is a small product for $47 by Patric Chan that’s designed to help you create a 5-part email series. 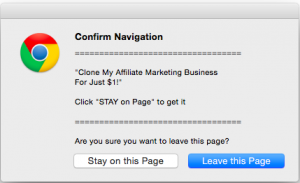 At the end of these 5 emails you’ll promote a product and, in theory, make money. 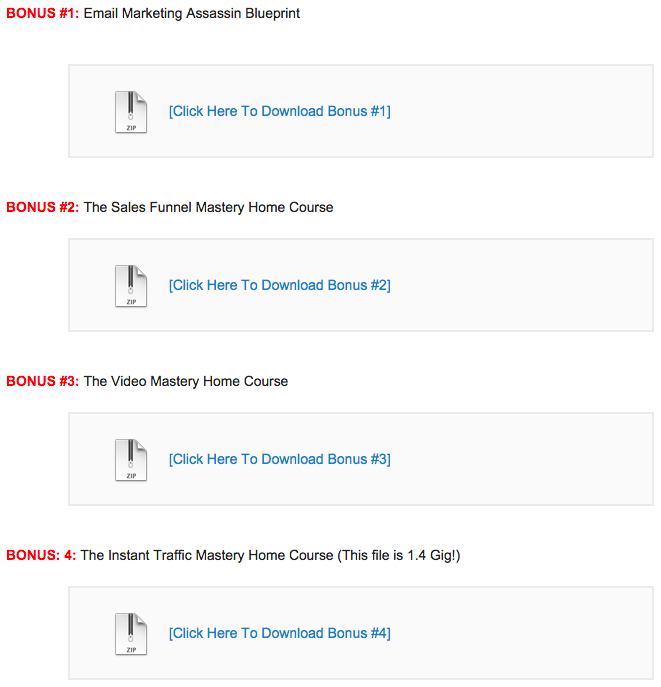 There are 4 parts to Patric’s course and it includes several bonuses. It seems like Patric has added a ton of bonuses to make the product seem more valuable but in all honesty, they’re not that great. To my surprise this product isn’t a complete piece of crap. First of all the course itself isn’t too bad. It’s a little outdated but the information is okay. 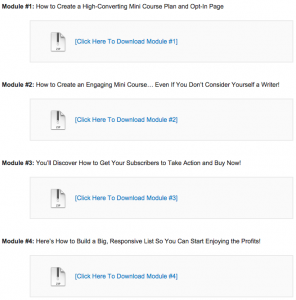 How to create a mini course and the landing page where your visitors will give you their email address. How to write the mini course. 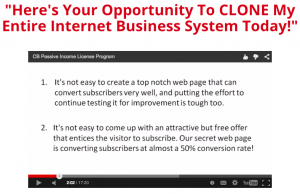 How to get the people who’ve signed up for the course to purchase the products you’ll promote. The only good PDF out of them all is the first one. Patric goes through how you’d research a niche to see if it’s one you could easily make money from. 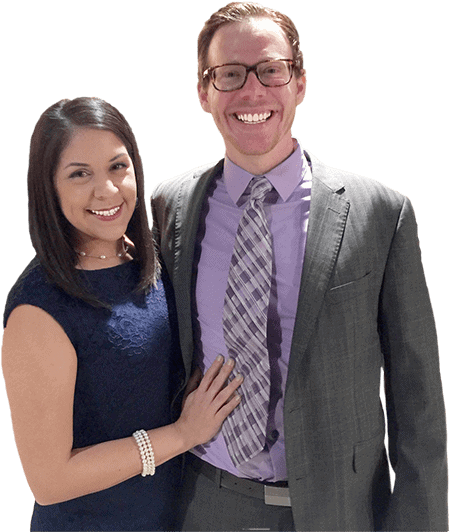 He walks you through how to find products on Amazon, ClickBank, and through Google Search that you can create an email course for and then promote to make money. He also talks you through how to pick a domain name that’s relevant. All of this is very good and is definitely something a complete beginner would benefit from if they purchased this course. The rest, however, is pretty poor when compared to the first PDF. There’s a little bit on how to create a good landing page but apart from that it’s not worth the money. There’s a video that shows you how to create your own product. It’s just over an hour long and walks you through how you’d research a potential product you could create. It walks you through how to find an audience, find out what problems they have, what they need to rectify these problems, and how you can create something to solve that problem. These are the essential components to creating a product that people are willing to buy. You ask the audience what they need to solve their problem, you create the solution, and then present it to them. You shouldn’t go creating something you think people want. This rarely works. But this isn’t a post for me to teach you how to create a product. The bonus video does a good job covering this topic, but an hour isn’t long enough to go into the details on how to do this properly. It’s more of a “broad strokes” approach and gives you enough that you could do the research and put something together. I’m afraid that these are the only good things I can say about Mini Course Formula. Now for all of the bad. He no longer keeps this product updated which can be an issue with how effective the information is. This is just a scam deployed to get people to sign up to his email list whilst making a bit of money. Both of these are bad. If he’s not keeping it updated, then the relevancy of what he’s teaching is affected because things constantly change in the online marketing world. Lots of things that worked in 2013 and 2014 aren’t working these days. If this is a scam… Then Patric is just another a**hole out there ripping people off without delivering what he’s promised. 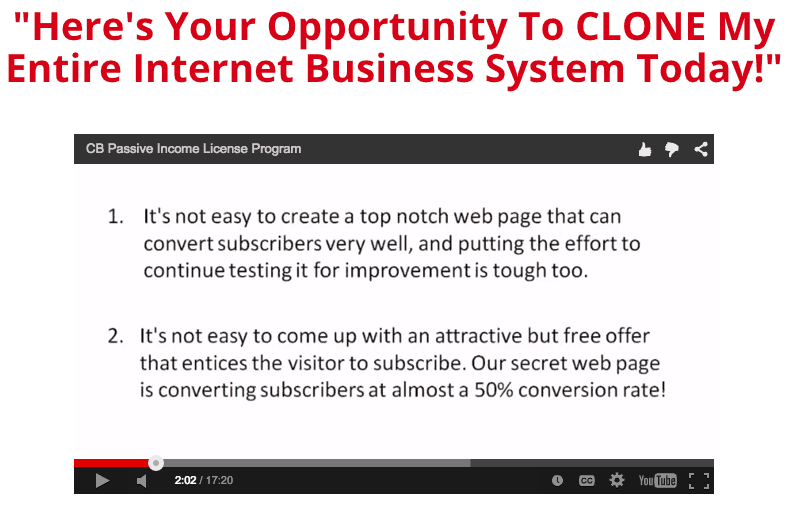 CB Passive Income (a link to our review) is a product which promises the same thing Mini Course Formula does. This is a massive sign that the product is a scam. I’ve never seen legitimate businesses use these tactics before. Lastly, within the Mini Course Formula training, Patric talks about using article marketing to promote your landing pages. He claims this is where you’ll get people’s email addresses. This dates the program terribly, and not in a good way. In 2011, 2012, and early 2013, article marketing was massively popular and effective. You could write a post on these websites and get very good rankings in Google’s search results. However, in late 2013 a Google algorithm update pretty much knocked all articles on these directories out of the search results. People were abusing the fact they could rank highly without delivering any value within the article. Now you need very high quality/relevant content to rank well in the search results, along with a few other things. 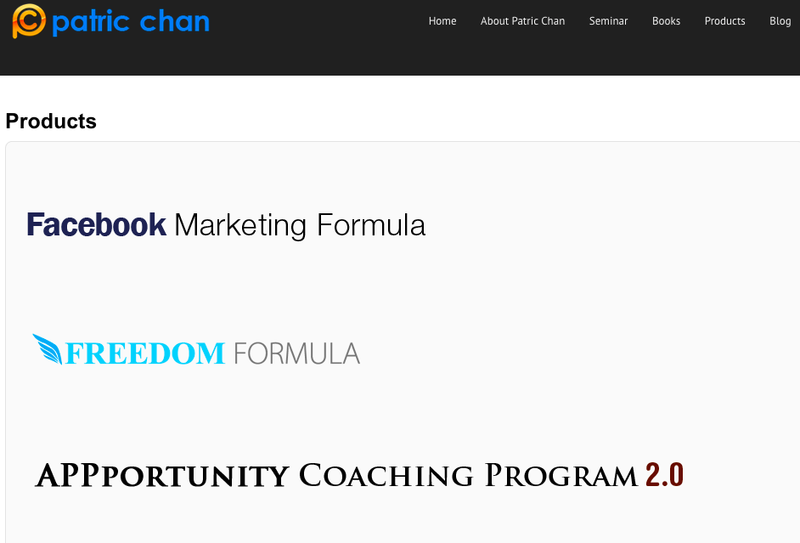 An outdated course means what Patric Chan teaches here isn’t going to be as remotely effective as it used to be, and it’s far from as effective as the sales page claims prior to you purchasing the product. 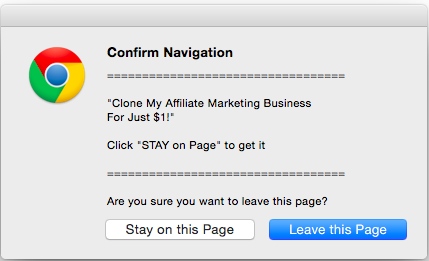 The classic “this is the only time you’ll see this offer” crap all the scammers tell you. You’ll be able to find this “offer” 365 days of the year just by trying to close the browser window. 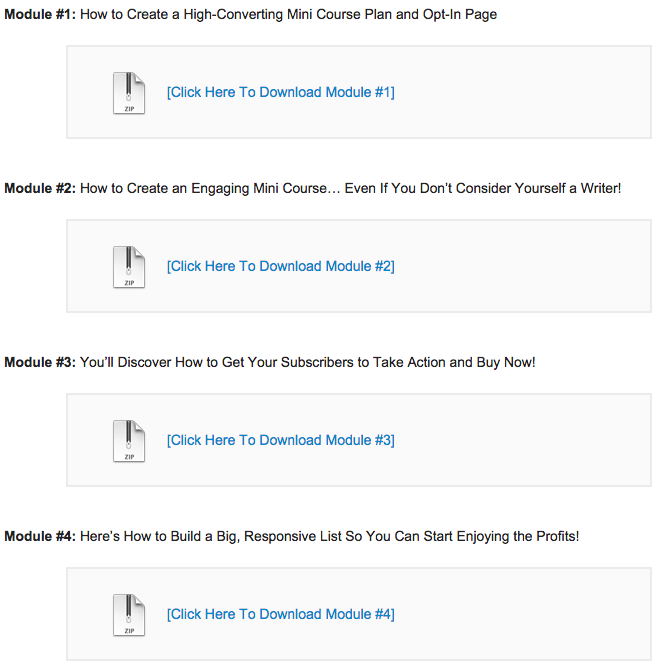 For $47 you can get something that’s up-to-date and will teach you much more than just creating a mini email course. 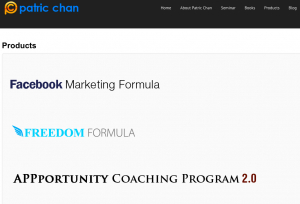 How do our 100% free, advanced training courses compare to Mini Course Formula? And of course, you risk nothing because our training is completely free. No strings attached. What do you all think about all of the above? Is $47 really worth paying for 1 good PDF out of the entire course? Especially when you can get a lot more effective training for the same price with out #1 recommendation? Leave your comments down below as I’d love to know what’s going on in between your ears.